AMD Radeon R5 Series Integrated Graphics – Play Minecraft at 1080p! Massive storage – A 1000GB/1TB hard drive will let you store around 50,000 songs, 120 hours of video, 285,000 photos or 260 movies. Includes a 21.5-Inch 1080p/full HD monitor, an LED-Backlit gaming keyboard and mouse kit and a great stereo gaming headset. The Fierce EXILE Desktop Gaming PC is impressively fast. Featuring the new AMD A-Series 7400K, running with a 3.9GHz Turbo across 2 cores to push the performance of the other components in your PC, you’ll have no issues destroying your opponents. Paired with AMD Radeon R5 Integrated Graphics and 8GB of 1600MHz memory, you’ll have great results running basic/online games at 1080p. 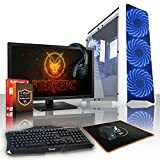 This PC will be perfect for anyone looking to start their PC gaming journey, with easy support for great games such as Minecraft, Terraria and Roblox, and great overall performance. These PCs can handle not only gaming, but office work, specialist programs and video editing without any hassle. Storage comes in the shape of a 1TB Hard Drive. Included is a 300Mbps Wireless Wi-Fi Network Adapter, and a standard UK or EU power cable, depending on your shipping address. All of our PCs are fully built, require no assembly and are tested by our experienced team of builders and quality control staff. This system does not include Windows – A trial version will be installed. This PC does not include an optical drive. An external DVD drive, USB drive or downloaded drivers will be required. Intel Celeron dual core, Celeron® n3050, Processor speed 1.6GHz. 24in display. Resolution 1920 x 1080 pixels. Powered by an Intel® Celeron® Processor N3050 the HP 411-a005na tower lets you enjoy entertainment, get your work done, stay in touch and do it all with a desktop PC that fits your budget. Conquer your day with the expanded storage, slimmer design, and tested reliability. 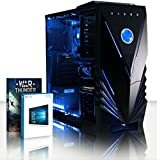 Finding an affordable tower with the performance you need and the name you trust just got easier.